Bacon can be a delicious addition to breakfast, lunch and even dinner. Frying bacon can be a pain, both in the mess it creates and the burns that can occur. An easier and healthier choice is to bake it. By baking the grease, fat and calories are reduced! Wondering how to cook bacon in the oven? First preheat the oven at 400 degrees. Prepare a baking sheet by placing foil on it. Place the strips of bacon along the foil; for added flavor sprinkle seasonings on bacon now. I would suggest brown sugar (to make it sweet). Dry mustard, pepper, and cayenne pepper are also very delicious ways to go (for a more spicy bacon). Bake for about 15 minutes, or until golden brown. 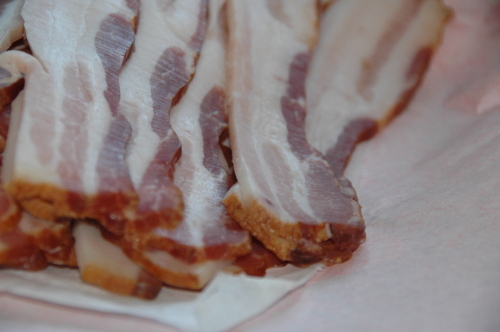 Depending on the time of day, there are a multitude of foods and drinks that go great with bacon. For breakfast there are the classic eggs, pancakes and orange juice. For lunch you can add bacon to make your sandwiches, soups and salads more exciting. Bacon is a treat that tastes great any time of day!